I am devastated. Everyone knows what happened. Rafa Nadal was defeated by David Ferrer in straight sets. The Rafa Slam dream is unrealized. Rafa injured himself during his opening service game, where Ferrer broke him. As soon as I saw Rafa go off court, go back on court his face said it all to me. I knew that he was hurt, this was serious. Although he courageously came back and tried to compete with all his heart, but his injury took the best of him physically, Rafa spirit endured. But his body & mind were at conflicts. If anyone thought that Rafa didn't want this Rafa Slam, just take a look at his the agony in his eyes, filled with pain. The Gladiator wounded. Rafa has given me so many great memories as a tennis fan, he has given me hope in times where I needed it the most. His heart, never give up, never surrender attitude is what I love most about him. 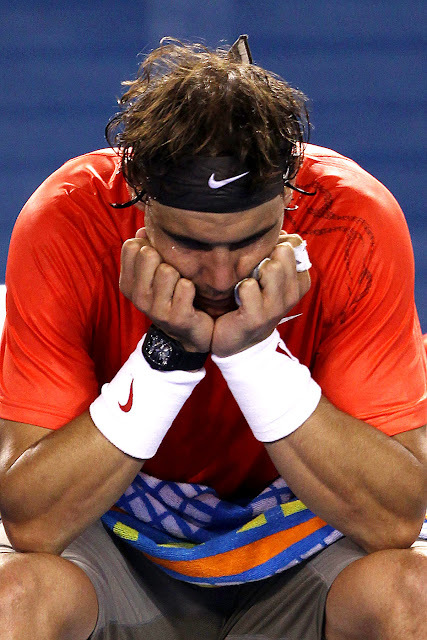 I only hope this injury isn't damaging to Rafa in the long run, anymore than damaging his dreams.. If anyone dare question this man's heart, loyalty to his profession & his respect for his fellow sportsman..